There are two types of amino resins: urea-formaldehyde (UF) and melamine-formaldehyde (MF). Both are used mainly as adhesives in the wood paneling industry for products such as particleboard, plywood, and medium-density fiberboard (MDF). They are made by numerous producers, as the technologies are well known requiring low capital investments. Larger producers have multiple locations to serve their customers because the adhesives are shipped in water solution, making long transport uneconomical. In 2016, the largest consumer was China, accounting for nearly 50% of each resin type. Growth has been strong in China as a result of greater output of panels for furniture and other goods used in interior applications. Other areas that are experiencing high growth rates are Central and Eastern Europe and the Middle East in response to greater domestic demand and higher exports. Urea resins have historically been the resin of choice for making interior panels for goods like case goods, cabinets, countertops, doors, furniture, and fixtures that are used in interior environments. Adhesives based on UF resins are inexpensive, cure quickly, and produce boards with smooth finishes that are easy to machine, paint, and laminate. However, UF resins are prone to off-gas fugitive emissions of formaldehyde that cause toxicity concerns. Europe and Japan have imposed regulations on the amount of off-gassing allowable in wooden boards. In North America, only the state of California has imposed similar regulations, although the US EPA has been planning comparable regulations that have stalled in Congress. Producers of wood panels have several options for meeting the standards, including using modified UF resins, phenol-formaldehyde and melamine-formaldehyde (which do not off-gas formaldehyde), or nonformaldehyde competing products like para-methylene diisocyanate (pMDI), polyvinyl acetate, and soy-based products. The modified UF resin technology consists of lowering the content of formaldehyde in the UF and adding scavengers like melamine or urea to absorb fugitive formaldehyde. In the United States, there has been a major switch away from UF adhesives, with about 25% of the particleboard, MDF, and hardwood plywood mills now using MDI and other products. In the developing nations, there is also a movement toward the use of more environmentally acceptable adhesives, in part, to be able to export goods to the European Union, Japan, or the United States to meet local regulations. Even with the restrictions, demand for UF resins is expected to grow. 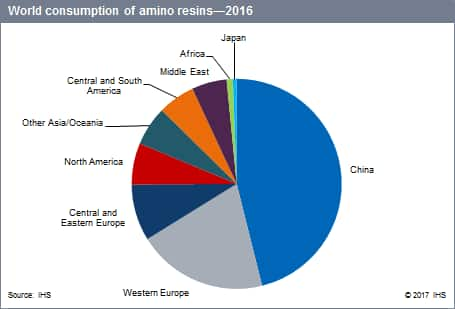 UF resin demand will grow about in line with wood panel production, which is expected to be highest in China, Eastern Europe, India, and smaller countries in Asia. Production of plywood and other panels in Russia and other CIS countries continues to increase as a result of growing export and domestic demand. In the Middle East, most of the growth will be in Turkey, where a number of new panel plants were recently installed. In South America, the industry suffered some recent setbacks because of political and economic unrest, but has the potential for significant growth because of plentiful forests and improving living standards. MF provides bonding superior to UF resins and is used in applications that are exposed to moisture, such as laminates for flooring. MF adhesives are also less prone to breakdown than UF, and thus do not present formaldehyde off-gassing concerns. However, their prices are considerably above those for UF. In surface coatings, MF resins are preferred to UF resins as curing agents for acrylic, polyester, and other resins as they produce coatings with superior properties for application to automobiles, appliances, and other high-valued durables. Europe and China will continue to be the leading consumers of MF for laminate flooring and wood adhesives. In Eastern Europe, more capacity is being installed to make laminate flooring, which continues to increase in consumer popularity. In the Middle East, Turkey has been growing in importance as a producer of wood laminate flooring, accounting for approximately 10% of global production. In the last 10 years, Turkish production increased 7–8% annually as a result of strong residential and commercial construction and remodeling activities. Overall average annual global growth should be in the 4–5% range for each resin. Demand for UF has moderated some in recent years because of concern over outgassing of formaldehyde, which has prompted some panel producers to switch to adhesives that contain no formaldehyde. However, many board producers now use modified UF resins to meet government regulations.